CenturyLink, (s ctl) the nation’s third-largest telephone company, has decided to get join Google,(s GOOG) AT&T(s T) and several municipalities and get gigabit fever as well. The company will offer a fiber-to-the-home, gigabit network in Omaha, Neb. beginning next week, with service to reach all of the Omaha CenturyLink subscribers in October. CenturyLink is upgrading its existing fiber architecture in west Omaha using GPON and will serve homes and businesses. Residential customers can bundle the gigabit speeds with existing video and voice service for $79.95 or subscribe to standalone service for $149.95. CenturyLink competes against Cox(s COX) Cable in Omaha, which offers a 150 Mbps service. CenturyLink needed to upgrade its existing fiber architecture in Omaha and wanted to create a more robust network that delivers fiber optic cable directly to homes and businesses. …We will evaluate our 1 Gbps offer to determine further deployment of this advanced technology. As a broadband reporter with a passionate belief that more broadband is better for our society and our ability to innovate, I’m thrilled to see more and more companies testing the waters on speed upgrades. When Google launched its roll-out plans to build out a gigabit network in Kansas City, it showed that it was willing to enter a capital-intensive business in order to protect its access to the consumer. At that time, ISPs were implementing caps and making a lot of noise about bandwidth hogs and the cost to upgrade networks for people watching video over the top. Yet, after Google announced Austin, Texas in April as its second location for Google Fiber, AT&T issued a press release saying it too wanted to use Google’s tactics to lay fiber to the home in Austin. It remains to be seen if AT&T takes those steps, but it’s great to see AT&T considering it. A week after Austin, Google said it purchased the fiber network in Provo, Utah (it apparently cost Google $1) and planned to turn on a gigabit network later this year. In Kansas City, Google charges $70 for gigabit-only service and $120 for a gigabit plus TV. Municipalities and smaller telcos are also getting in the game. Last Friday I covered Vermont’s telco, VTel, and its existing gigabit network that residents can connect to for $35 a month. In a talk with the CEO of VTel, he told me that the he thinks that gigabit fiber is the only way to bring residents and his business into the future. But his $151 million investment costs were offset by $94 million in government loans and grants. The company will evaluate its Omaha 1 Gbps offer before determining further deployment of this advanced technology, considering such factors as positive community support, competitive parity in the marketplace and the ability to earn a reasonable return on its investment. I’m curious about all of those things myself. If a traditional telco can invest in gigabit networks and charge a fair rate for them, then I’ll expect to see them pop up in more places. And not just in places targeted by Google. Curious to hear an official comment on data caps on that service. You won’t see data caps on broadband here in the U.S., Chris. Only cellular coverage has data caps. Unfortunately, not true. Mediacom a mostly rural cable internet provider instituted data caps on their residential internet service in November of 2012 – they range from 250GB to 999GB per month depending on the speed package selected. If a customer goes over the cap, they are charged in $10 increments for each additional 10GB the customer goes over – i.e. if a customer goes over by 12 GB they would pay $20 extra. 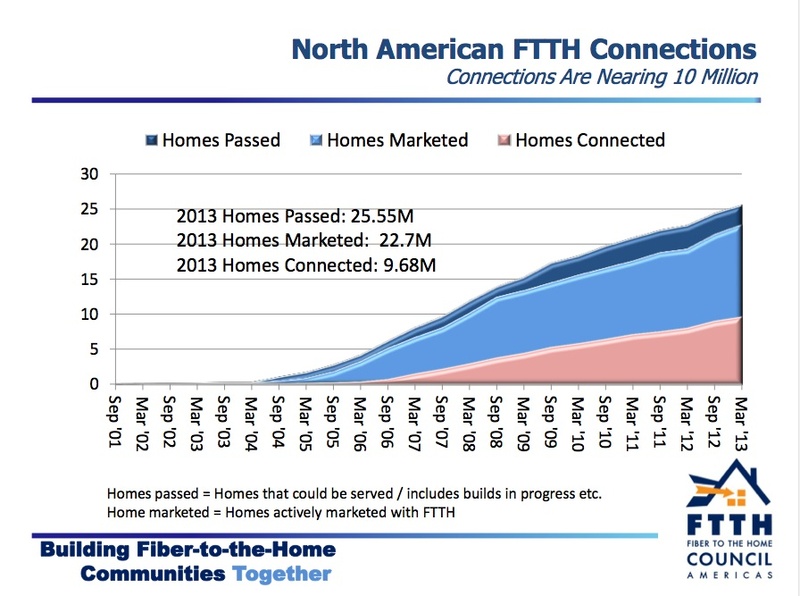 Proof of the concept that $5 invested in fiber will get you $7 in three years. How conservative is that. But if you still think Google can’t get the last mile monopolists off their duff, what if Google offered to start a ‘Price Club for Small-market Fiber’ that got million users volume discounts to businessmen in 50,000 user markets.